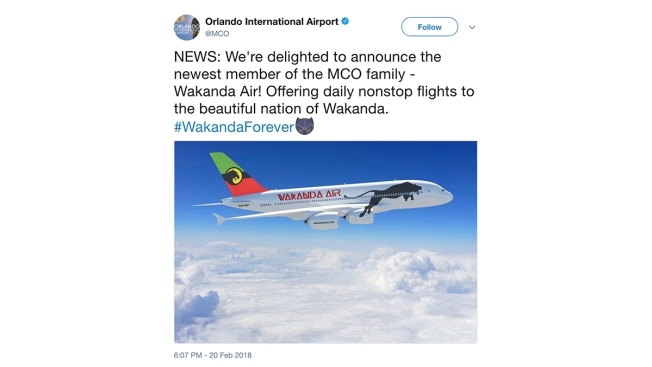 Orlando International Airport tweeted a photo of an airplane bearing the words "Wakanda Air" and a black panther logo. The tweet said the airport was "delighted to announce ... daily nonstop flights to the beautiful nation of Wakanda." Hartsfield-Jackson Atlanta International Airport tweeted a photo of a sign listing a 7:30 p.m. departure to Wakanda with the words, "The bags are packed. #Wakanda forever." Lupita Nyong'o tweeted back, "Apart from La Femme Nakia, what else is on the in-flight entertainment? T'Challa's Angels, M'Baku To The Future, Shuri's Gotta Have It, Killmonger Bill, W'Kabi In The Woods...?"